Brazilian President-Elect Jair Bolsonaro, dubbed the “Trump of the tropics,” is a far-right populist who has praised Brazil’s former military dictatorship, insulted women, and threatened to jail political opponents. He also has big plans for reviving the country’s moribund economy that could raise tensions with Brazil’s biggest trade partner, China. Though Bolsonaro’s tough-on-crime approach won more headlines during the election, his proposed economic policies loom large for a country reeling from recession. Over his nearly three decades in Congress, Bolsonaro was a fan of state intervention in the economy. Yet, as a candidate, he leaned heavily on the free-market credentials of Paulo Guedes, a University of Chicago–educated economist. 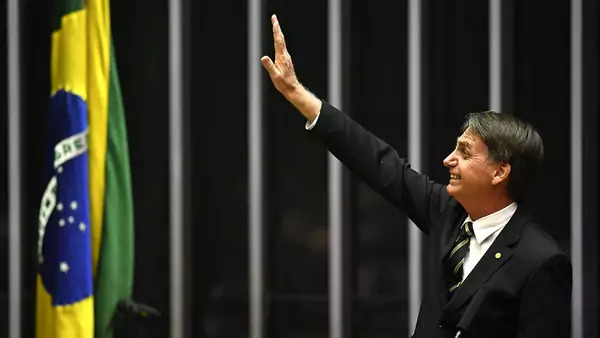 Bolsonaro plans to make Guedes a “super minister” for Brazil’s economy, combining the finance, trade, and planning ministries, and Guedes has grand ambitions for reform. A decade ago, Brazil was an increasingly assertive global power with a fast-growing economy fueled by commodities such as soybeans, sugar, and oil. Its largest customer was China: from 2000 to 2013, trade with China grew by over 4,000 percent. During this period, Brazil won the rights to host the World Cup and the Olympics, and it felt emboldened enough to campaign for a permanent seat on the UN Security Council. But in 2014 Brazil’s economy tumbled into its deepest-ever recession, worsened by slowing growth in China. The economy shrank by more than 7 percent before beginning a tepid recovery in 2017. Unemployment is still near 12 percent, and the government deficit remains over 7 percent of gross domestic product (GDP). Pension reform. Pension spending is the biggest driver of the deficit, accounting for more than 8 percent of Brazil’s GDP. With the country’s population aging fast, that could more than double in coming decades. Privatization. Guedes advocates selling off Brazil’s “crown jewels,” the state firms that dominate the economy, including oil giant Petrobras, the power company Electrobras, and banks such as Banco do Brasil. Tax cuts. He says slashing taxes and simplifying the tax code will spark private investment and create ten million jobs. Trade deals. Like U.S. President Donald J. Trump, Guedes prefers bilateral trade deals, and he has criticized the “restrictive” regional bloc Mercosur. It’s unclear, however, how committed Bolsonaro is to Guedes’s vision. Pension reform could be a politically explosive issue, as outgoing President Michel Temer’s failed efforts demonstrated. However, without action on this front to stabilize Brazil’s finances, investors could reverse their positive reaction to Bolsonaro’s win. Caught Between Beijing and Washington? The Bolsonaro administration takes over on January 1, after which its legislative priorities will be clearer. Yet, the contours of tensions over China are already emerging. The Trump administration praised Bolsonaro’s election, seeing him as part of an emerging axis of pro-U.S. leaders in Latin America, and has floated a potential bilateral trade agreement. But while Bolsonaro would likely welcome a new alignment with the United States, Trump’s trade war with Beijing has actually boosted Brazilian exports to China—and analysts say that Bolsonaro could struggle to deliver growth without Chinese help.